In honor of Valentine's Day, see the trends in women's giving and show your love to organizations that make a difference. Engineer launches a thankful app plus a new wine choice solution. Meet Daisy Hernandez and learn her tips on global team leadership. Gloria's "The Sum": Who Says Women Can’t Rule Stem? Kimberly Peeler-Allen of Higher Heights, urges WOC to run for office. Show your love this Valentine's Day for Take The Lead and donate to the non-profit organization with the mission of gender parity in leadership by 2025. The "Raise Your Voice" panel at the Makers 2018 conference included CAA agent Maha Dakhil; actresses Rashida Jones and Natalie Portman; director Melina Matsoukas; former assistant to President Obama and chief of staff to Michelle Obama Tina Tchen; lawyer Nina Shaw; actress Katie McGrath and director Ava DuVernay. To honor Black History Month, meet these women making history today. Mikaela Shiffrin faces her doubts at the Olympics. Janice Bryant Howroyd is founder and chief executive of Act 1 Group. Join us on Valentine’s Day for a conversation about how women are giving and why. 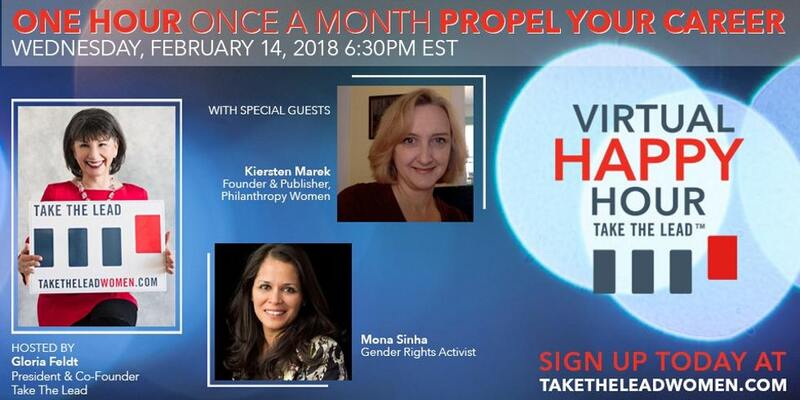 Become part of the conversation with Kiersten Marek, Founder and Publisher of Philanthropy Women; Mona Sinha, Board Member of Women Moving Millions and a founding member of the Asian Women’s Leadership University and Trustee of Smith College, hosted by Gloria Feldt, President & Co-Founder of Take The Lead. Find out how to put your “power to” to work from these dynamic women who will share what they know about the world of philanthropic organizations, what women need to know about how to make their contributions count, and what they have learned from the women they’ve worked with in changing the world. As we move from #MeToo to #powerTOlead, you'll want to hear what you can do to make a difference.